Yes, Shin! I'm ready to lose the fat & get lean and ripped with shorter, more effective workouts! I understand that by joining today, I get instant access to your daily online workouts and exercise videos, health & nutrition articles, community forums, and much more. I understand that membership is $29.95 billed monthly and I can cancel any time to stop future billing by visiting my account page in the members area or by sending an email request. If you're not absolutely THRILLED for any reason, I don't want your money! 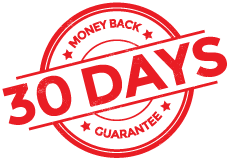 Simply contact me within 30 days for a prompt, no-hassle, no-questions-asked refund. Place your order from anywhere in the world and join over 387,119 people in 104 countries (and counting!) who are shedding fat & getting lean with MAX Workouts. MAX Workouts is so much more than just "a program". I NEVER join online clubs EVER and I thought for SURE I would cancel this one, but I gave the free trial a shot and I'm addicted. There is so much to read and learn and the daily workouts with detailed video lessons are GREAT!! And they can be done at home or at the gym, which is a SUPER plus. I feel the passion for working out that I used to have coming back all over again! I would like to comment on the power of the forums. I found time and again the moderators and senior members kept me on track when I was doubting I could do something, about to head off in some non- beneficial direction or just needed someone to cheer for me when I did something well. I am a fairly self disciplined person alone, but with the help on the forum, I could easily finish the programme. I may well have given up a few times when unsure of how to approach, for example, a holiday where there was no gym or an exercise which I simply couldn't perform at first. The greatest part of MAX Workouts is the support from every angle of fitness. Shin has dialed in how to communicate what is important to maintain good health. His books are ridiculously easy to understand, and more importantly put into practice. In addition, the constant publication of new articles from Shin and the message boards are incredibly useful tools that continue to motivate me and provide clear direction as to how to stay on the right path. Shin, I was in the Fitness Business in Toronto for 40 years and was Editor of Fitness Business Canada a Trade Publication for a couple of years. You have the best way of reducing the information down into the important parts and I have totally enjoyed the resources and access to your videos. I have totally rehabilitated a bad hip/groin that has nagged me for years by following your program and hip rehab program. Your approach is fabulous and very motivating.